Holidaze: Guide to Gifting Everyone on Your List - craving currently. 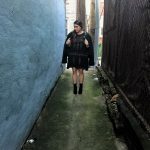 So my last post was a Gift Guide showcasing all the uniquely amazing gifts you can get for under $50. 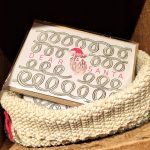 Today I wanted to share a gift guide for all those important, but likely hard people to buy for on your list – that you might want to spend a little more than $50 on. Whether it’s your Brother whose really into traveling or your Cousin who is constantly on the cusp of all the latest tech gadgets – this guide will help navigate everyone on your list. So if you’re craving currently an easy way to check off everyone on your list this year – this guides your go-to. The Charles, Treason Toting Company. 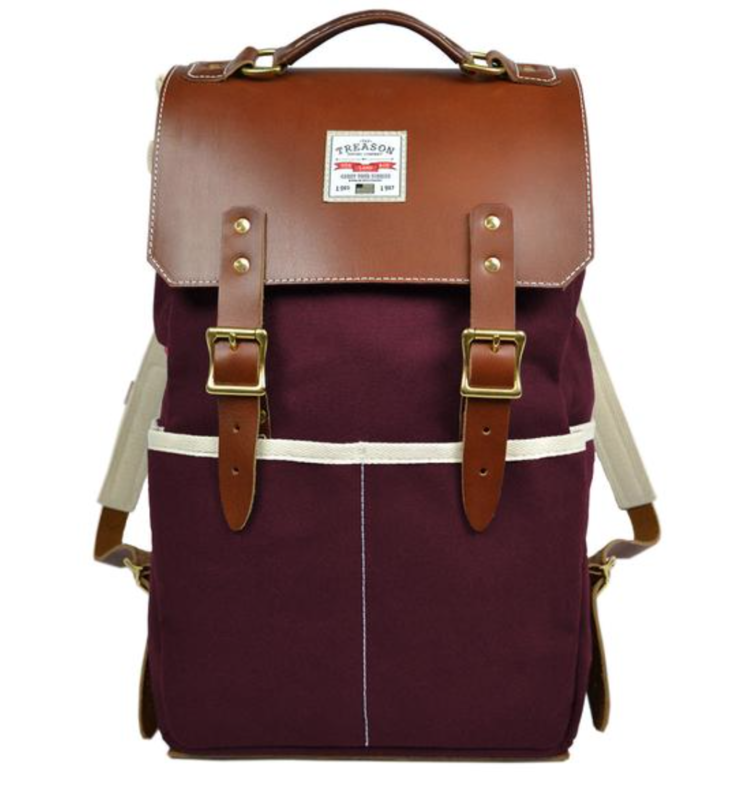 I shared the Utility Pouch by Treason Toting in my last post – (which is under $50!) but if you’re looking for a gift to really get the traveler on your list from point A to B, C, D, E, you get the idea, then this bag should be on your list. 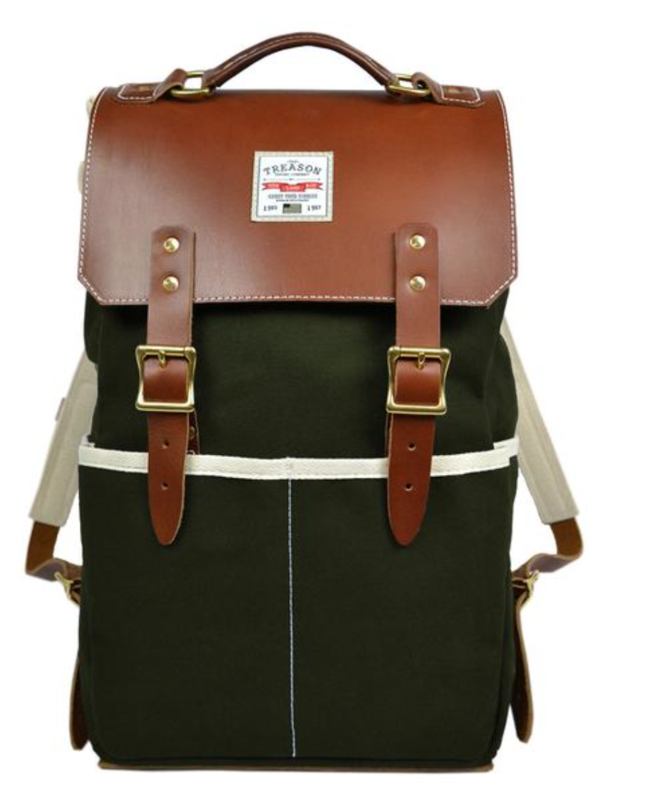 With it’s multiple pockets and unique design the recipient of this bag will be forever grateful. 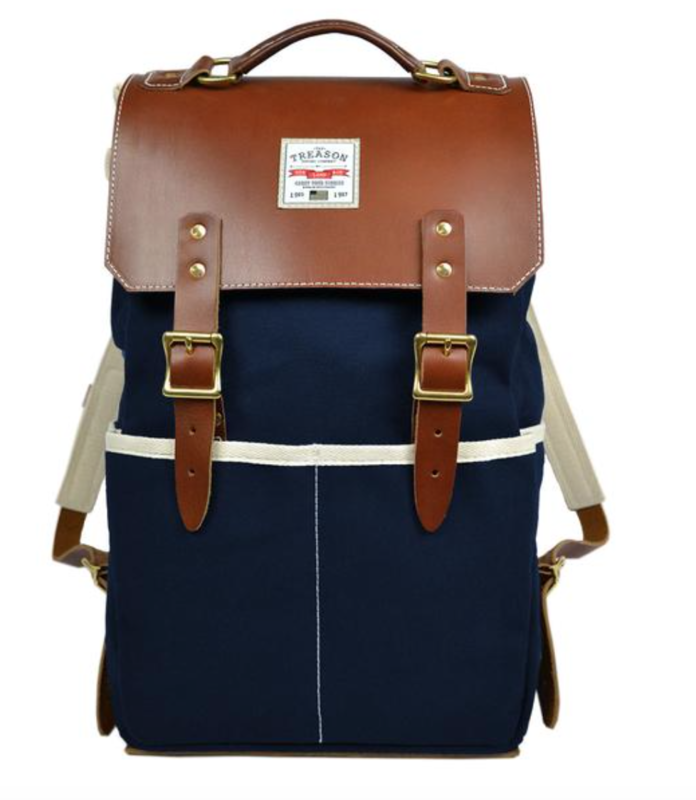 This bag comes in four amazing colors as well. 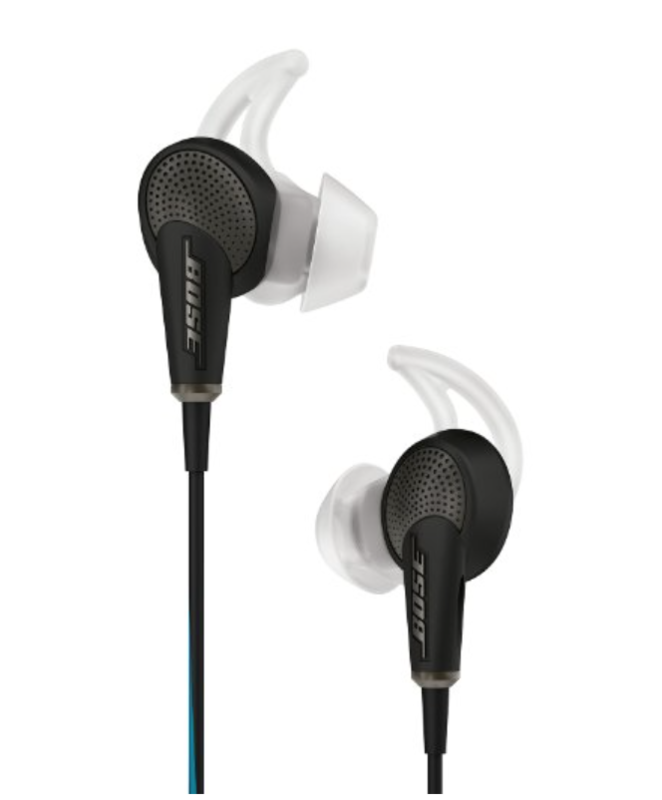 Bose Quiet Comfort Headphones, Amazon. That one person who is always traveling for work. Whether its a train ride to NY for the day or a flight to LA, the last thing you want is to hear about the relationship issues of Tommy and Jane via the phone conversation of the person next to you. Trust me, heard it – hated it. The work commuter on your list will thank you for these noise cancelling ear buds. Not as cumbersome to carry as those other large headphones and they have adjustable modes that allow for full noise canceling or regular play to let in some sound when it’s necessary. 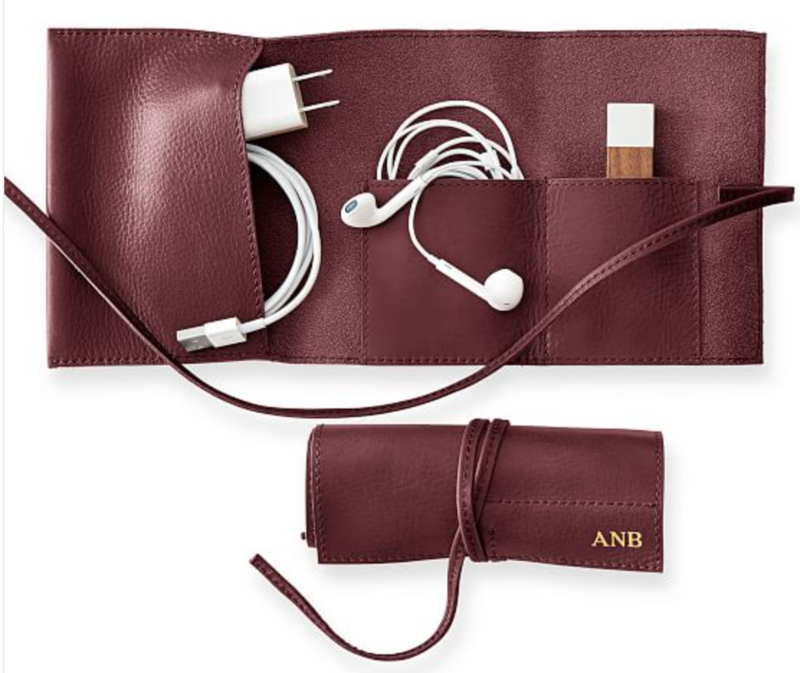 With the constant connections needed to access all their daily technology the Techie on your list is likely carrying around chargers randomly placed in pockets and bags. Help them get a little organization in their tech infused life with this charger transport holder. Staying connected and charged has literally never been easier. What do you get that one person who is always telling you about their latest food adventure? The one posting drool worthy photos of that crab cake benedict on Instagram and consistently killing it with the snapchat stories of brunch? 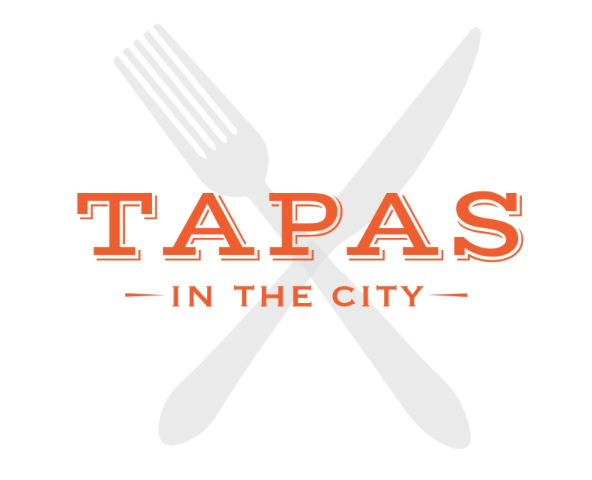 Well you need to treat them with a night out via Tapas in the City. An adventure any foodie will gladly accept. Don’t believe me – check out their Instagram and try not to drool. You know that person on your list who is always trying to get you to go to a fitness class with them? That person who always seems to be beating you in steps on FitBit? Give them the gift of a different kind of workout – a motivating, encouraging, fun (dare I say that) workout. Pure Barre! I started my Pure Barre journey with Pure Barre Baltimore a couple months ago and haven’t looked back since. Three classes AND sticky socks for $30 is an amazing deal and your Fit Friend will thank you! We all know that one person who always has plans or is typically planning all those must-attend events for us. They seem to always have all the details planned perfectly. Make their life easier to plan with this all in one planner by ban.do. 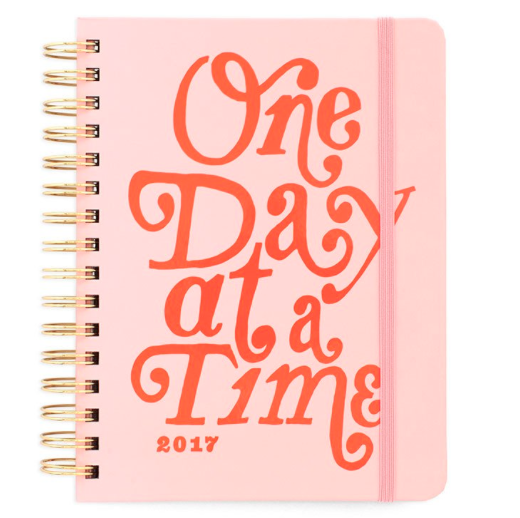 With amazingly inspiring notes throughout and so many notes pages – this planner will keep your planner friend truly buzzing, one day at a time. 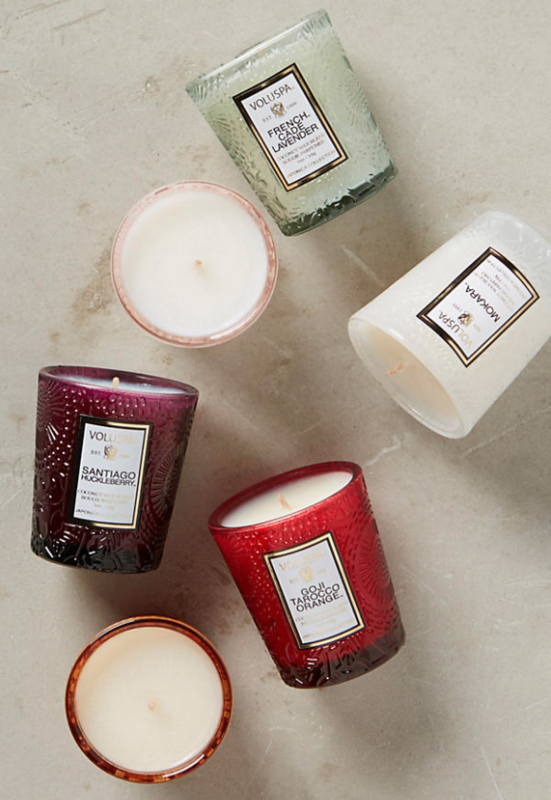 I linked the smaller gift set in my under $50 gifting guide but if you really want to wow the Hostess with the Mostest get them this gift set of 12, yes 12, Voluspa candles. If they haven’t smelled one of these babies they will immediately fall in love. 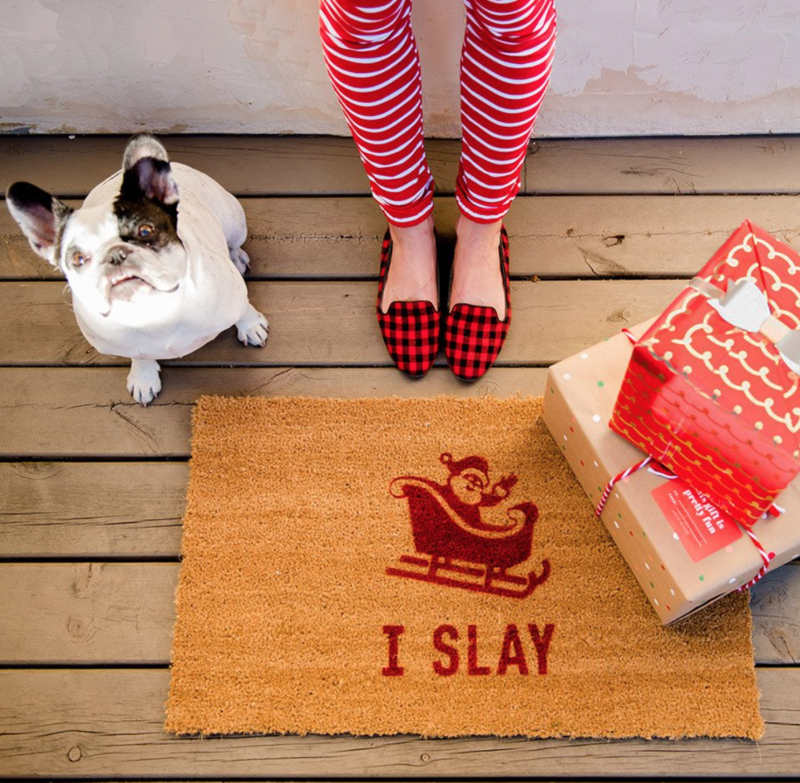 Aside from the fact that there’s an adorable Frenchie in this photo I’m obsessed with this front door mat. That one person on your list who literally cannot get enough Christmas will be obsessed too – you can let them know that they truly SLAY the Christmas game. Honestly, for the yogi on your list or any person who likes lounging. 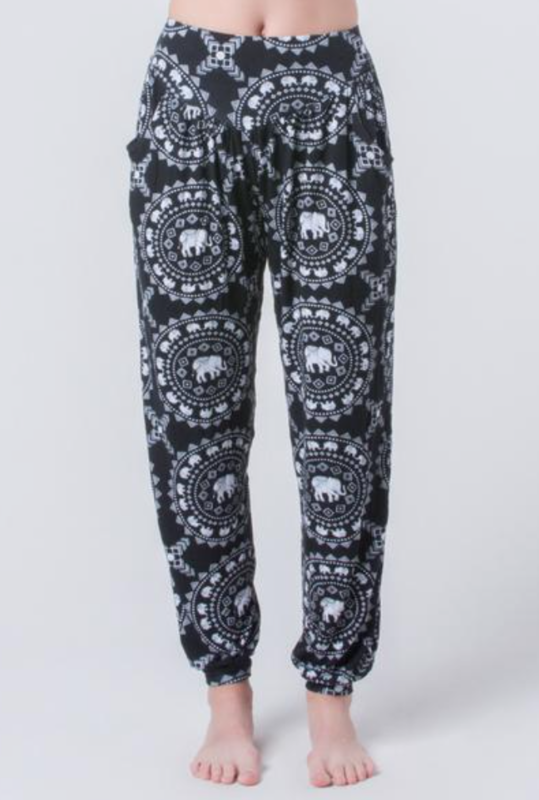 The elephant pants are the perfect gift to give. Not only do they make the receiver happy but as a corporate sponsor of the International Elephant Foundation, this brand [The Elephant Pants] donates a portion of every sale to help create a sustainable future for elephants. Win Win. Every dog owner knows that no matter how many toys you buy for your dog you can always use more. Why? Well because if your dog is anything like my dog, toys get destroyed – d e s t r o y e d. So the best gift for the dog owner on your list? A subscription to BarkBox. 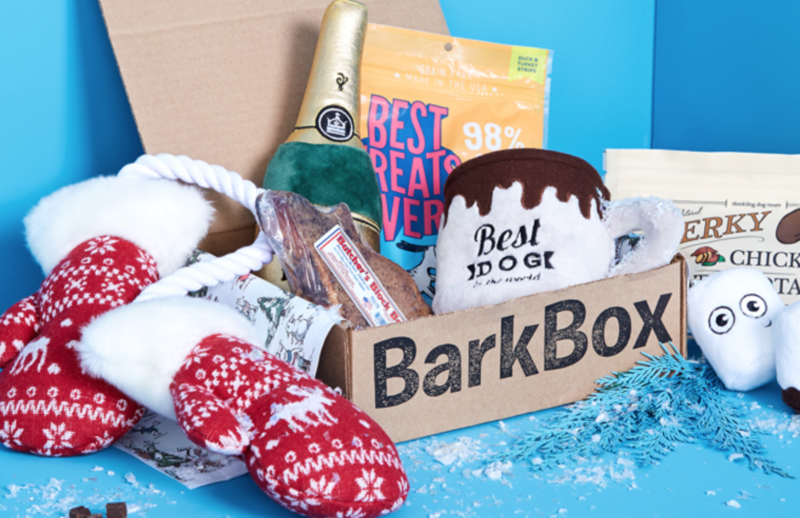 You can choose between 1, 3, 6, or 12 months to gift and the dog owner on your list will get a box of treats and toys delivered right to their door step – which they, and their furry little BFF will love you for. We all have one – that one person on our list who literally has E V E R Y T H I N G. What do we get this person? The easiest answer would be nothing – I mean they do have everything right? I kid I kid. Here’s my idea for that one difficult person on your list – buy them an adventure. So there you have it loves, the gift guide for all those people in our lives we all have and love. 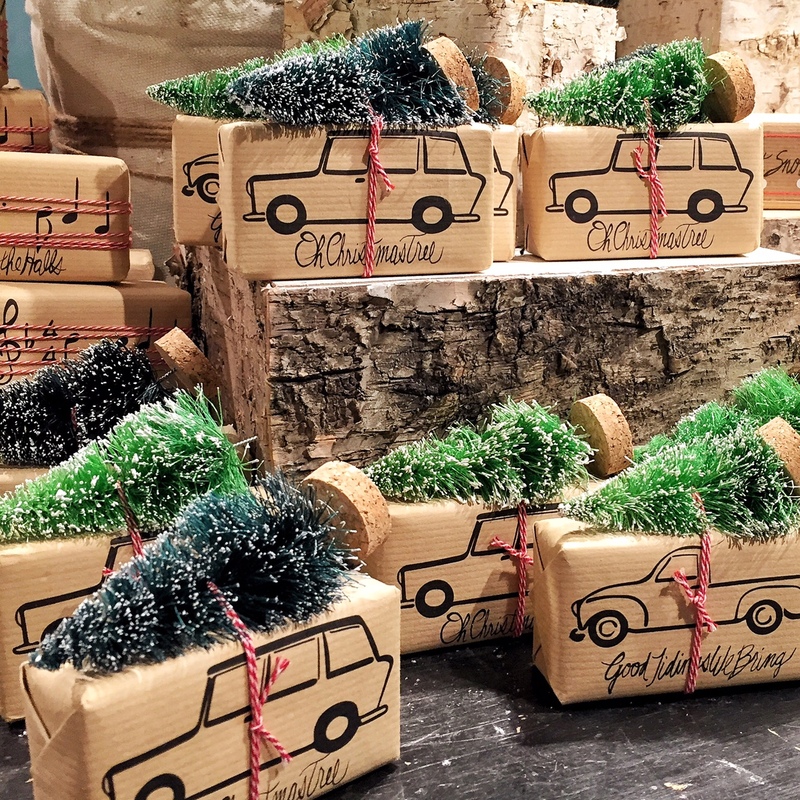 Previous Post Holidaze: Guide to Gifting Under $50. Next Post Holidaze: Sparkle + Fur.